MINNEAPOLIS (AP) — In a story Nov. 20 about Minnesota Gov. Mark Dayton preparing to leave the Mayo Clinic, The Associated Press reported erroneously that he said he had turned over control to Lt. Gov. Michelle Fischbach for the time he was under anesthesia. Dayton said he did not do that. MINNEAPOLIS (AP) — Gov. Mark Dayton said Tuesday his health has rebounded enough from post-surgical complications for him to leave Mayo Clinic this week, and he defended his office’s low-key handling of a hospitalization that lasted more than a month. Dayton, 71, said he will be “thrilled” to be back in St. Paul on Wednesday to celebrate his last Thanksgiving as governor with his family and his dogs. Speaking in a strong, clear voice, Dayton spoke with reporters by phone from the Rochester, Minnesota, clinic. Dayton’s lungs suffered damage from complications after he underwent two back surgeries, but he said they “have improved considerably in the last two weeks” and that he seldom has to use oxygen any more. “I see definite signs of improvement,” said Dayton, adding he’s looking forward to getting down on the floor and romping with his grandson. “That’s my primary objective,” he said. The surgeries fused vertebrae to improve stability of Dayton’s back and legs. Dayton said he did not turn over control to Republican Lt. Gov. Michelle Fischbach for the time he was under anesthesia. He also defended his office’s handing of his extended hospital stay. It wasn’t publicly announced, though at least one daily email from his communications staff noted it. That Oct. 29 email said Dayton would not attend the traditional trick-or-treating at the governor’s mansion because he was recovering “from back surgeries” at Mayo. “I stand by our veracity,” Dayton said. Dayton, who did not seek a third term, will be succeeded in January by Democrat Tim Walz. 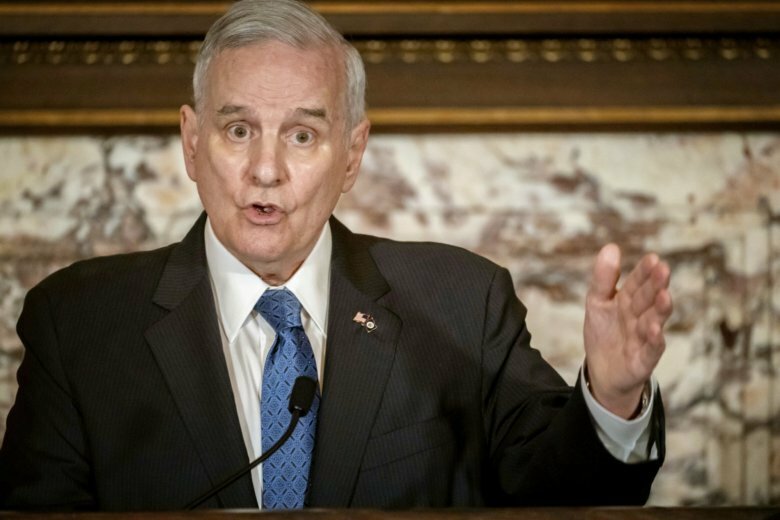 Dayton said he has had two conversations with Walz during his hospital stay and plans to meet with his successor as early as next week. Dayton, who often clashed with the Republican-dominated Legislature, said Walz will have the advantage of working with a state House that will be controlled by Democrats after big gains in the November election. “What a huge difference that will make,” Dayton said. At Mayo, Dayton said he used the same gym as other patients for rehabilitation and that he occasionally was recognized. “It’s been extremely frustrating to be waylaid here. I recognize the limits imposed by my lung damage. It’s nothing I bargained for,” Dayton said. Follow Jeff Baenen on Twitter at https://twitter.com/jeffbaenen .